Politicians have been urged to leave the Electoral Commission alone to concentrate on delivering the 2017 national elections. 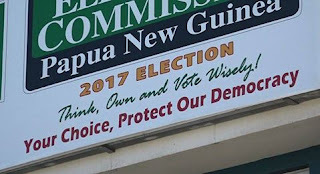 The Office of the Electoral Commissioner, was responding to damning allegations by the Opposition Leader, accusing Patilias Gamato of rigging the election process by succumbing to directions of the ruling People's National Congress party. Don Polye had issued a statement accusing Mr Gamato of lying about the cost of printing the ballot papers, saying the Government Printer, Christine Lenturut had quoted the commission K12 million for the printing and not K23 million as claimed by Mr Gamato. Mr Polye had also said that according to Mrs Lenturut the Government Printing office does have the capacity to deliver the ballot papers as it as always done in the past. But the Commissioner's office, says Mr. Gamato has already explained why he chose to print the ballot papers in Indonesia and will not comment further. It says, Mr Gamato will not be drawn into a media circus and will remain silent to concentrate on delivering 2017 National Election. Prime Minister Peter O'Neill, also used the Parliament sitting to clear the air about Mr Gamato's decisions and the PNC's alleged involvement. "The printing is being done overseas because of security measures. "Some of the printing requirements of the ballot papers cannot be provided by even the Government Printer, and secondly on the pricing. "The quote that the electoral commissioner has received is well over K20 million plus, and of course the printing in the Indonesia is about K6.5 million. "As he has gone publicly in the press and media saying that Treid Printing has some relationship to PNC, we have had a caucus meeting and I have asked every member of our party, do they have an association with the company, and not one single association. "So (Mr speaker) I will get the electoral commissioner to write to the opposition leader directly informing him of the process of the tender he has conducted, and who is the agent of the company here in PNG so that he (Polye) can be satisfied of the process that he (Gamato) has followed. "But as far as NEC and the government is concern, and as I have indicated on Tuesday, we have no visibility. "Visibility on the contacts, not only on printing but even security and all the other arrangements that the electoral commissioner does. "We have no visibility or we have no say in who he appoints."